We care about YOU, that’s why we developed this range to allow our customers the opportunity to work out and unwind. Sore muscles can be a thing of the past after you have tried our Workout Wonder and Liquid Yoga. Think Zen, think refreshed, think Mio. Do you have increased muscle tension? Then look no further than the Mio Sore Muscles Range as each product contributes to helping ease both mucles and mind! Our formulas are here to help ease feelings of muscle tension and dissolve any weary woes. 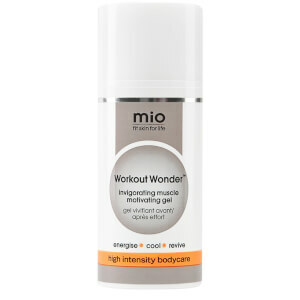 Whether you want to energise or relax muscles Mio's sore muscles range can help! This invigorating range refocuses our attention on your well-being and mindfulness. Our invigorating cool aid can help to ease muscle tension and release stress. The reviving gel can be used pre or post workout. If used before, then Workout Wonder can boost your body into action. If used after, then the miracle gel can help you forget about lasting muscle tension – so you can wake up happy! Alternatively, our Workout Wonder can cool sore muscles. We often find ourselves using this product throughout the day, specifically on our necks and temples to help ease stiffness and get us through the stresses of daily life. It’s a little treat that doesn’t go a miss at Mio HQ! Give it a try, you never know, you may love it! Top Tip – To minimise muscle tension, make sure you stretch out each part of your body effectively after exercise. Allow 5 minutes for this at the end of any workout – then of course apply our Workout Wonder! Invigorate your senses and soak away stress with the help of our Liquid Yoga and a lovely warm bath. Muscle tension can cause pain to any mundane task, why not end your day with our wind-down wonder. Rich in minerals and therapeutic herbs, this unique blend can transform your tired body. With a high concentrate of magnesium, Liquid Yoga can help to relieve cramps and aches. Do you have trouble with sleeping? Then our restorative bath soak can help to de-stress both your body and mind. With extracts of lavender and cypress leaf oil, Liquid Yoga may assit a peaceful night’s sleep. There is no other bath treatment as rich in incredible actives. We understand the luxury of lying in a tub of bubbles, but many do not realise that SLS, the ingredient that creates bubbles, is also found in your dishwashing liquid and floor cleaner. 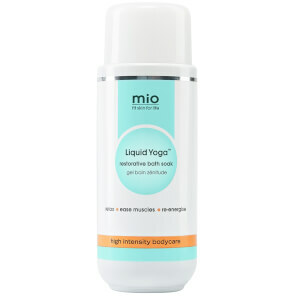 The common skin irritant is not used in our Liquid Yoga, so you can relax assured that your skin comes first with Mio. Top Tip – Turn off your phone for once and break away from the world for 20 minutes to focus on yourself. Succumb your mind to the therapeutic aromas and your body can follow.